The holidays can be pricey, but here’s a way to help pets that doesn’t cost you any money, just some time. Shelters and rescues always need volunteers. Walking dogs, socializing cats, cleaning litterboxes, brushing pets so they look their best, answering phones — there’s so much that needs to be done to help pets find homes and I’ve yet to see a shelter or rescue that couldn’t use some extra help. I actually fell in love with animal welfare when I started volunteering at a shelter. It might not turn into a career for you like it did for me, but here are my other favorite reasons to volunteer. 1. You’ll help pets. This is a no-brainer, but something to remember. Even on cold mornings when I didn’t exactly want to jump out of bed and take the bus to the shelter, I knew that there were dogs waiting to be walked and cats who needed care as soon as I got there. That helped me make it until I had enough caffeine in my system to get out the door. 2. You’ll make friends! Many of my closest friends are people I met at my local shelter. When I moved out to DC, I didn’t know a lot of people and my job at the time wasn’t conduscive to making friends. Once I started volunteering at the shelter I found kareoke buds, book club friends and some of my now-dearest friends. An extra benefit for me is that having something we were working on together helped me get over my natural shyness. I’m not good at going up to a random stranger and saying “hey, that book you’re reading is one of my favorites, let’s be buds!” But it was easy to ask for help with a cat or advice on a dog which soon led to giving advice to other volunteers and having close conversations. 3. You’ll learn a lot for your own pets. Most of what I know now about taking good care of my cat has its roots in what I learned at my shelter. I didn’t grow up with cats and learning at the shelter helped me be a better cat parent to Toby. In addition, I’m a lot better with friend’s dogs because of all my practice with dogs of different personalities at the shelter! 4. You’ll be more inclined to be active. I don’t like to run. The only time in my life I have ever consistently gone running was when I was running the dogs at my local shelter three days a week. I’ll wimp out on exercise promises to myself, but I couldn’t wimp out on giving those pups the best exercise i was capable of giving. 5. You’ll build skills that are applicable outside of animal welfare. At the shelter I learned to stand taller and be more confident — skills that helped me outside of the shelter. Making connections with other volunteers allowed me to bring more value to my job at the time. In addition, I always had something I could talk about when meeting new clients or coworkers who wanted to know what I did outside the office. I’d always been a bookworm, but being able to talk about the pets I was helping seemed to open more doors than the latest science fiction novel keeping me up at night! 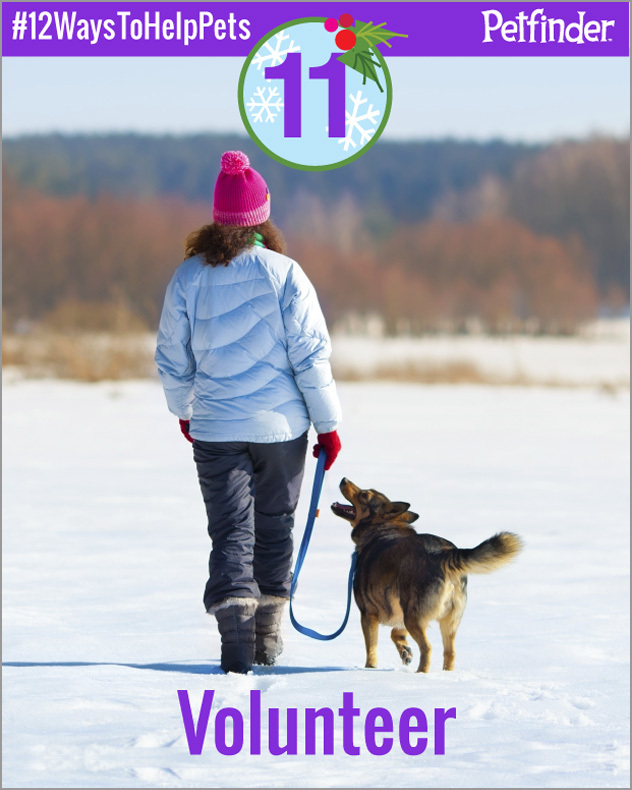 Whatever reason you choose for volunteering, you can help a lot of pets with just a little bit of your time. If you’ll be volunteering, don’t forget to take the pledge to help pets so you can have a chance to win!